EPA 27 MPG Hwy/18 MPG City! Third Row Seat, Rear Air, Aluminum Wheels, Back-Up Camera, AUDIO SYSTEM, CHEVROLET MYLINK RADIO, LT CLOTH PREFERRED EQUIPMENT GROUP, TRANSMISSION, 9-SPEED AUTOMATIC, ENGINE, 3.6L V6, SIDI, VVT CLICK ME! Third Row Seat, Rear Air, Back-Up Camera Chevrolet LT Cloth with SUMMIT WHITE exterior and JET BLACK interior features a V6 Cylinder Engine with 310 HP at 6800 RPM*. ENGINE, 3.6L V6, SIDI, VVT (310 hp [232.0 kW] @ 6800 rpm, 266 lb-ft of torque [361 N-m] @ 2800 rpm) (STD), TRANSMISSION, 9-SPEED AUTOMATIC (STD), LT CLOTH PREFERRED EQUIPMENT GROUP Includes Standard Equipment, AUDIO SYSTEM, CHEVROLET MYLINK RADIO with 7" diagonal color touch-screen and AM/FM stereo, includes Bluetooth streaming audio for music and most phones; featuring Android Auto and Apple CarPlay capability for compatible phones (STD). Privacy Glass, Keyless Entry, Steering Wheel Controls, Child Safety Locks, Heated Mirrors, Electronic Stability Control, Bucket Seats. 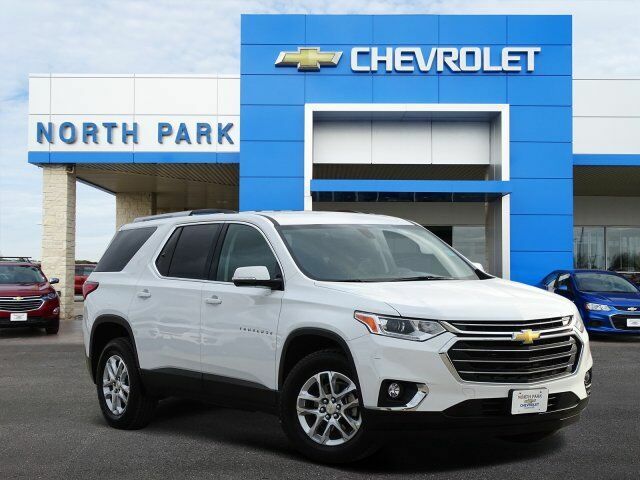 "With 98.5 cubic feet of available space, the Traverse is tops in the class when it comes to interior space. It also has more room behind the third-row seat compared to other vehicles in its class." -Edmunds.com.